A simple pumpkin waffles recipe from scratch! 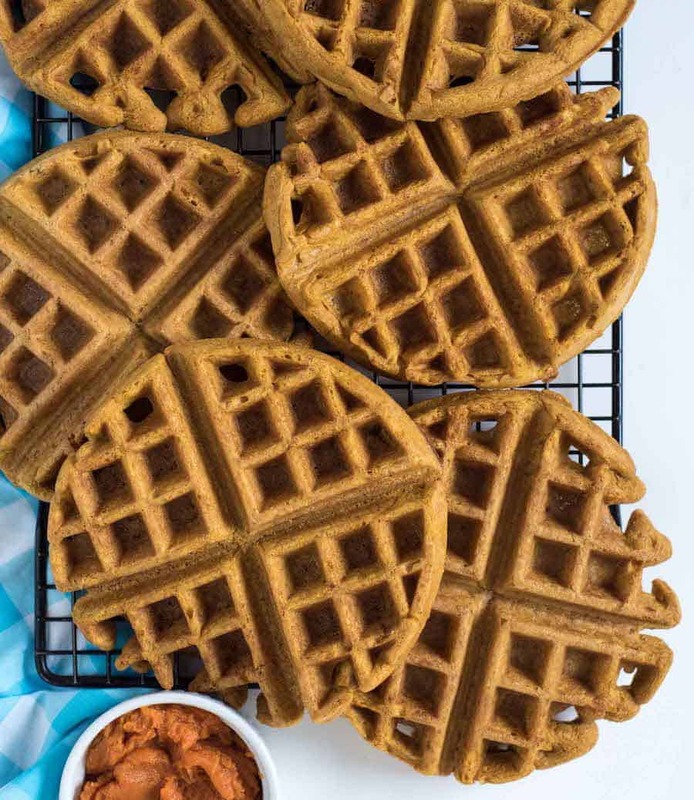 Perfect light and fluffy whole wheat pumpkin waffles for a healthy breakfast. I cook my kids a hot breakfast most mornings and save the cold cereal for Saturday mornings when mama wants to sleep in a minute. This whole wheat pumpkin recipe is one of the very oldest recipes on the blog (I published it for the first time in 2010!) 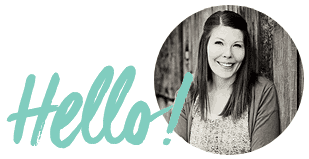 and today it’s getting a much-needed makeover and republish to the top of the blog. I wanted to bring it out of the archives because it’s still one of my very favorite recipes and I make it all the time (not just in the fall either). Whole wheat pumpkin waffles are the perfect start to any busy day. They only take about 10 minutes to mix together, a few minutes to cook, and then you are on your way with something filling and warm. This makes a large batch of waffles which is great if you want to eat them a second time that week or freeze half for later. 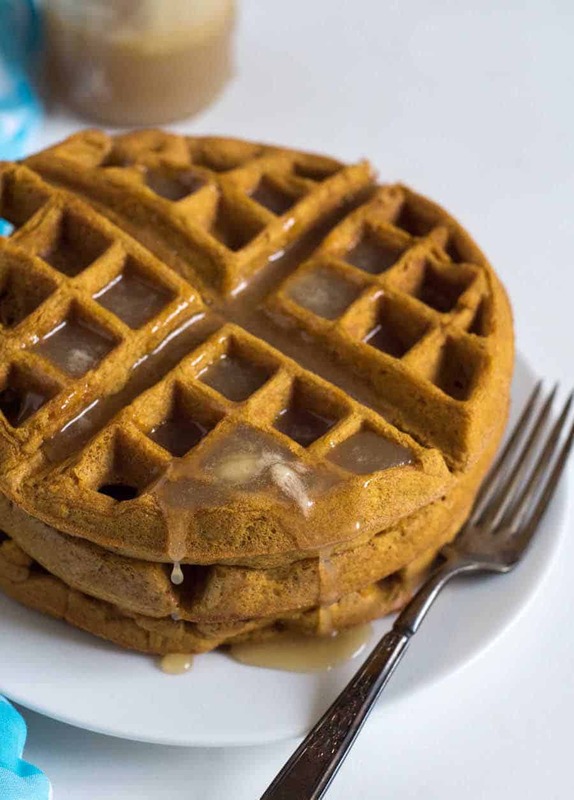 The pumpkin makes the waffles a lovely color – plus the addition of cinnamon or pumpkin pie spice makes you feel like you are eating dessert for breakfast; never a bad thing in my book. Thanks to whole grains and pumpkin, these waffles are full of fiber which helps keep tummies full until lunch. You all know how much I love vegetables and when you can get your kids to eat a vegetable at breakfast, I feel like you are winning at life. A few of my kids will enjoy a green smoothie with me, but for everyone else, pumpkin waffles are the way to go. You’ll love how soft and fluffy these waffles are too (thanks to lots of eggs!). No whole wheat hockey pucks here. This recipe is part of Pumpkin Week that I’m doing with my friend Emily from One Lovely Life. We are sharing our favorite pumpkin recipes all week long. You can check out her here pumpkin blender oatmeal pancakes here, don’t they look so good? I like to use a whole wheat flour that is labeled “white whole wheat”. That simply means it’s whole wheat flour that has been milled from white wheat berries (opposed to red wheat berries). It tends to be a little lighter and tastes a little less wheaty than whole wheat flour ground from the red wheat berries. Once you start looking at the packages of wheat flour, you’ll see what I’m talking about. If you want to turn pumpkin waffles into pumpkin pancakes, simply add enough milk to make a thinner pancake batter. You know it’s thin enough when it spreads nicely on a hot cast iron skillet. 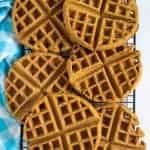 This recipe makes a pretty big batch of waffles (10 Belgian waffles) so plan on using half the recipe for later in the week (cook once, eat twice! ), store half in the freezer for a later date, or just cut the recipe in half to make 5 waffles instead. You can use a can of pumpkin puree or about 2 cups of homemade pumpkin puree. Both are great options. A simple pumpkin waffles recipe from scratch! 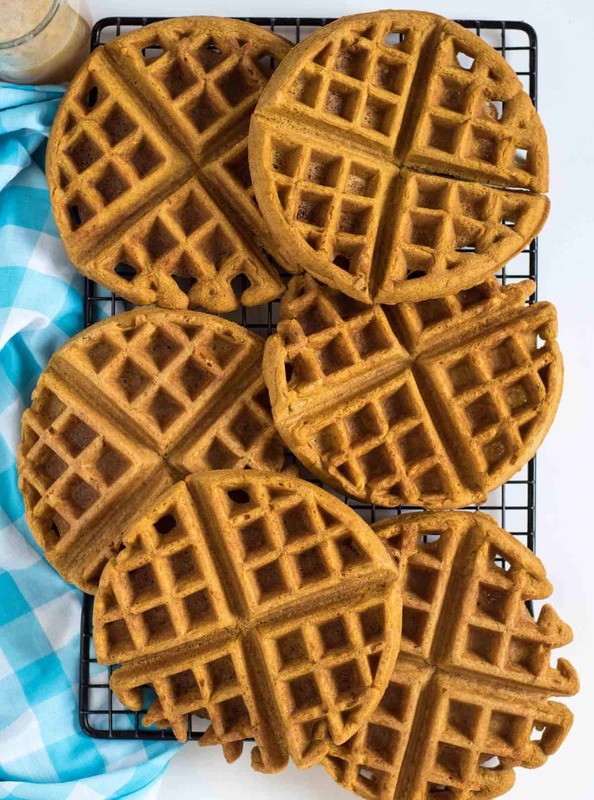 Perfect light and fluffy whole wheat pumpkin waffles. These easy waffles make a healthy & delicious breakfast! Use a whisk to combine them all and then make a large well in the center. Add all of the wet ingredients to the well and then start whisking the two together. Whisk from the middle of the bowl out, slowly making your way out to the dry ingredients. You are slowly incorporating the dry so that they don’t get clumpy. When well-combined, cook according to your waffle iron directions. Serve with lots of butter and real maple syrup. Freeze the extras for a quick breakfast and reheat in the toaster. I can’t wait for you to make one of my all-time favorite recipes. This is the kind of recipe that I hope my kids have fond memories of one day and every time they make and eat them, they’ll think of all the mornings in their mama’s kitchen enjoying this recipe. I hope that this recipe can become a staple in your home too. Other hot breakfasts that we love are easy egg bakes, caramel apple oatmeal, and healthy banana waffles. This recipe was originally published in December 2010 and has been republished in September 2017. 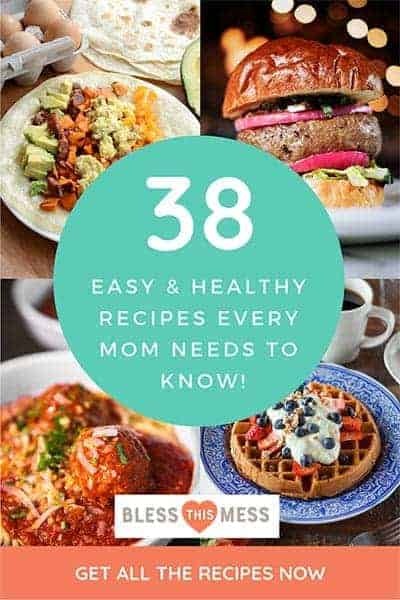 The text, recipe, and pictures have been updated. how would you adjust this recipe to make pancakes? Just add enough extra milk to make them pancakeable – does that make sense? They should work just great if they are thin enough to spread out on the griddle. An extra couple of tablespoons of milk should thin it out if it doesn’t spread out when cooked! Let me know how it works! Approximately how much pumpkin is that (in relation to cups)? Added about 1/4 cup sugar and about 1 tsp. of pumpkin pie spice. These were OK but I don’t think I’ll make them again – seemed really “eggy” to me. is that tablespoons or teaspoons?? Any idea how many calories are in these waffles? Sorry… I don’t have any software that does calorie counts. Any luck finding something online to help? Where did you get the heart shaped waffle iron? And are the plates removable for easy cleaning?? The recipe is great, did not add the sugar as someone did since it is part of a weight loss menu. I used Bisquick Gluten Free Pancake and Waffle mix only because I didn’t have whole wheat flour. They turned out delicious! I think this is my new favorite breakfast! Amazing recipe! I doubled it because we have two teens in our house and wanted enough for the week. Well.. we have more than 25 waffles for the week. Everyone loved them. Crispy on the outside, soft on the inside and delicious! No syrup needed. And no guilt about indulging in them! Thanks!! Hooray! I love hearing that, thank you for the great review!